As I have stated before in these pages, and countless other people have said in the past, money drives everything. This does not at all mean that actions with an eye on the dollar are unethical. What it does mean is that money is a mandatory component of all business activity and actions taken have to be based on that reality. Awareness of and readiness for the right things is mandatory for long-run success but a rush to those right things, moving too quickly ahead of your competitors, can be very financially damaging. The balancing act in timing actions requires skill and nerve. Going to my favorite source, John Heuter at RDN, there was an article on March 27th about the Boyd Group and its investment in equipment. An analysis of the numbers spent based on the number of locations suggests that they are spending a good amount of money, probably more than most of their competitors. Boyd recognizes the rapidly changing environment and the importance of safe repairs. The next day Bulbuck was wearing a seemingly very different hat. In this article, he is talking to investors and explaining the performance of Boyd over the last year. He stated that insurance company relations were very important to Boyd and they had maintained excellent relations with their DRP connected insurers. Insurers care about metrics and Bulbuck said the three most important are cycle time, CSI and severity. Reducing these terms to honest language, the faster and cheaper you can get it done the higher points you will score with the insurance company. If you keep the customer happy you will score more points. None of these metrics give any weight to safety; cycle time and severity will suffer from the time and cost of these repairs. A dealer calibration will add a few hundred dollars and a day or two to cycle time. The correct OEM mandated replacement of a damaged rail section will add hundreds of dollars of cost, and another hit to cycle time. The car owner doesn’t know much about how their car was built and how it should be repaired so if they get it back clean, shiny and as scheduled they assume it has been fixed right and on time they are happy. This uninformed happiness is a poor substitute for true quality control. So why is Boyd buying the equipment if all it seems to do is get in the way of the important metrics? The answer to this is in Bulbuck’s quote with the words ‘proactive’ and ‘anticipated.’ Boyd is very aware of the need for safe repairs and they are in line with many other progressive operators in rapidly moving toward these safe repairs. It will not be, for Boyd or anyone else, a one day switch from past practice to best future practice. For the best operators, it will be an honest and accelerating transition to these best repairs. Progressive and intelligent operators know that they are to some extent ahead of current metrics but they also know the metrics will shift and the hard work of preparing of this needed change will pay off. Balancing this with the need to stay alive in current market conditions is the skill and nerve part. What is Being Measured ? One hot topic of the past few months has been the measurement of results, commonly referred to in the collision repair industry as Key Performance Indicators (KPIs.) In the insurer repairer world, the relationship is based almost completely on these numbers with the most important being customer satisfaction and anything that affects cost. This July ,2016 article by John Huetter in RDN includes a very interesting video link that has since resurfaced in a number of other articles. Going back to my irreverent heading for this post ‘10s all around’ but something was definitely not right. Repairs will not get less complex and the answer will not be for consumers to become educated about the technical aspects of vehicle repair. The industry will have to mature to the point where the ability to perform safe repairs on modern vehicles becomes the minimum entry point for participants. Collision Diagnostic Services of Texas has developed the second generation of their asTech remote scanner. Learn more about the asTech scanner. This equipment is priced currently in the $2,500US range making it affordable to any progressive repair shop and allows that independent shop to remotely connect with OEM scan equipment, which is definitely not affordable for that independent shop. Perhaps if a shop did 90% Toyotas or Hondas they could afford the cost and training for equipment for that one brand, but if they are repairing almost all brands the total cost would be prohibitive and the training very complex. 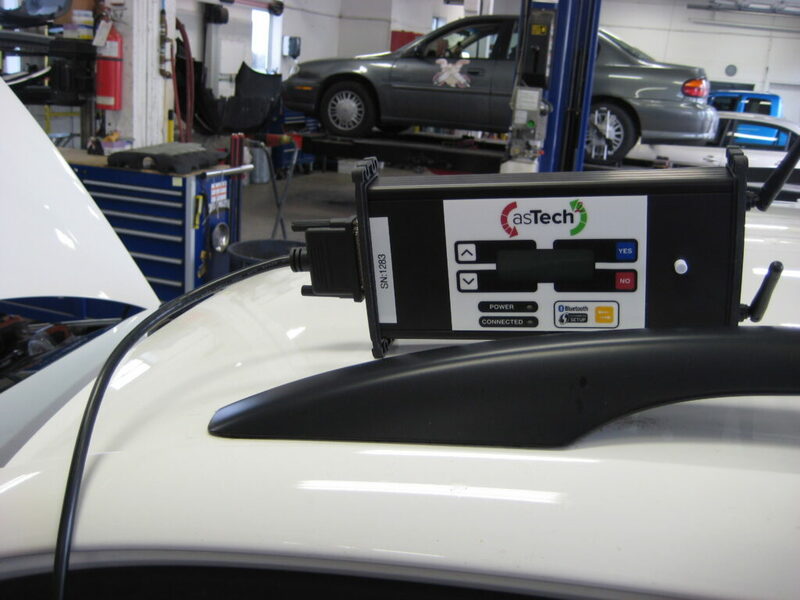 The asTech2 unit is connected to the vehicles OBD (On Board Diagnostic) port and communicates over the internet with the CDS offices in Texas, where a group of trained automotive technicians works with the full range of OEM scanners to diagnose the vehicle electronics. A pre–repair scan aids significantly in damage diagnosis and the post repair scan does two things; the first is to verify that all systems are working; the second is to reset and recalibrate components to ready mode after repairs are completed. Before the availability of this technology vehicles would have to be driven to the dealer for many code re-sets. This would add a day to the repair process, or if there were no dash lights on the re-set would simply not be done. It is easy to imagine that the very useful (and rapidly becoming mandatory on new cars) pre-repair scan would very seldom be done if it required taking the car to the dealership before work could even start.